The private pilot was conducting a local flight. He reported that, during the flight, the engine started to run roughly. He decided to return to the airport for a precautionary landing. About 4 miles from the airport and while lined up for landing, the pilot increased the engine throttle with no response; the airplane lost total power. He decided to land the airplane on a roadway about 1 mile from the airport. After landing on the roadway and coming to a complete stop, the pilot restarted the engine and attempted to taxi off the roadway. 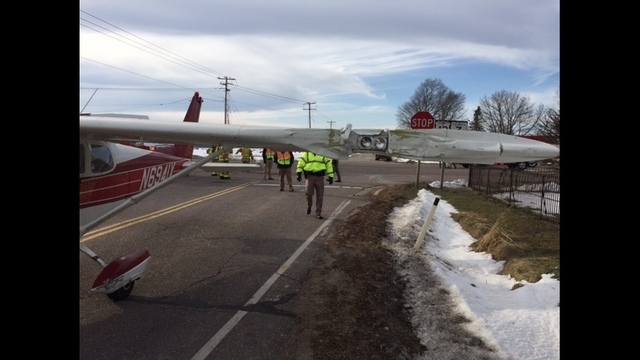 While he was taxiing the airplane, it struck three roadway signs and a fence, which resulted in structural damage to the left wing. After the airplane was recovered, small amounts of water were present in the fuel from both wing sumps and the gascolator. The engine was started, ran normally, and both magnetos checked within normal limits. The loss of engine power could have resulted from water in the fuel but the definitive reason could not be determined. Although the pilot landed the airplane successfully on the roadway after having engine power problems, his decision to taxi the airplane from the roadway and his failure to avoid the roadway signs and fence resulted in substantial damage to the airplane. The pilot's decision to taxi the airplane from the roadway and his subsequent failure to maintain clearance from signs and a fence after a successful emergency landing following a total loss of engine power. 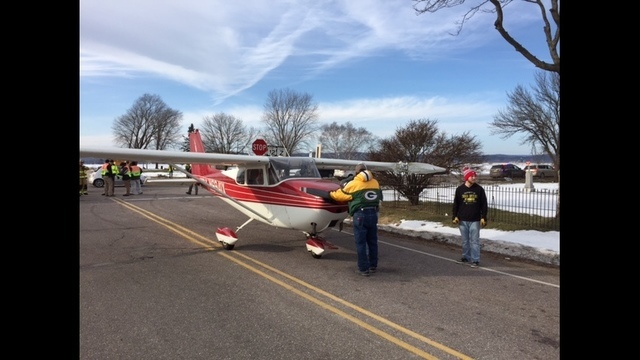 On December 28, 2016, about 1230 central standard time, a Cessna 172B single engine airplane, N6941X, registered to a private individual, sustained substantial damage after it struck roadway signs while attempting to taxi after a successful emergency landing near Prairie Du Sac, Wisconsin. The private pilot and one passenger were not injured. The flight was being conducted under the provisions of Federal Code of Regulations Part 91. Visual meteorological conditions prevailed throughout the area and a flight plan was not filed. The flight originated from the Sauk-Prairie Airport (91C), Prairie Du Sac, Wisconsin about 1130. The pilot reported that he was flying locally at 4,500 feet after departing from 91C. The engine started to run rough and the pilot applied carburetor heat. He decided to return to the airport for a precautionary landing. About 4 miles from the airport, and lined up for landing on runway 18, the pilot increased the engine throttle but had no response. He decided to land on a roadway about 1 mile from the airport. 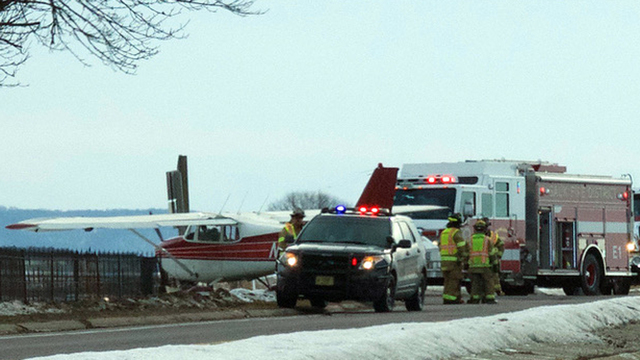 After landing on the roadway and coming to a stop, the pilot started the engine and attempted to taxi off the roadway. While taxiing, the airplane struck 3 road signs and an iron fence, resulting in structural damage to the left wing. 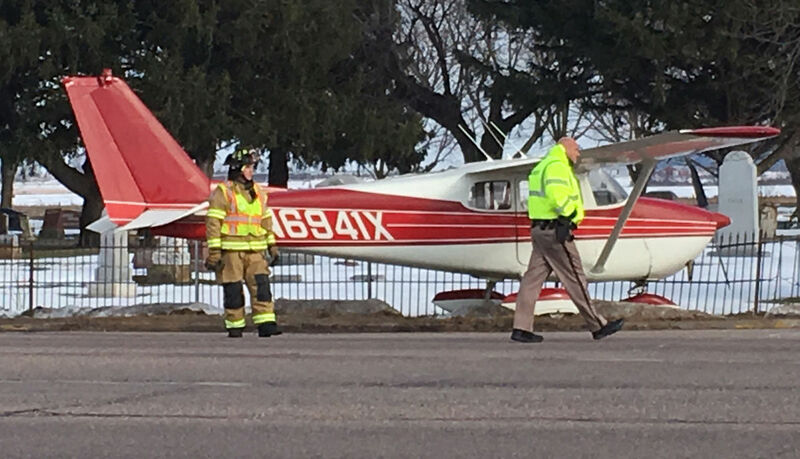 The local Sheriff closed the highway as the airplane was loaded onto a trailer and transported to 91C where it was examined by an FAA inspector. Approximately 4-5 gallons of fuel were present in each wing tank. Small amounts of water were present in the fuel from both wing sumps and the gascolator. The engine was started, ran normally, and both magnetos checked within normal limits. The fuel appeared to be automotive fuel. The pilot confirmed that he used automotive fuel. Review of the logbooks did not disclose that the airplane was approved for the use of automotive fuel. 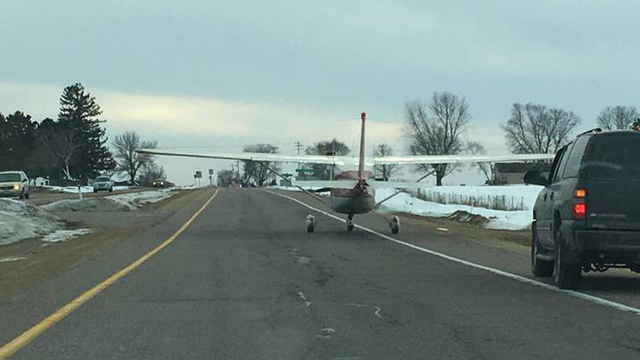 On December 28, 2016, about 1230 central standard time, a Cessna 172B single engine airplane, N6941X, registered to a private individual, sustained substantial damage after it struck roadway signs while attempting to taxi after a successful emergency landing. The private pilot and one passenger were not injured. The flight was being conducted under the provisions of Federal Code of Regulations Part 91. Visual meteorological conditions prevailed throughout the area and a flight plan was not filed. 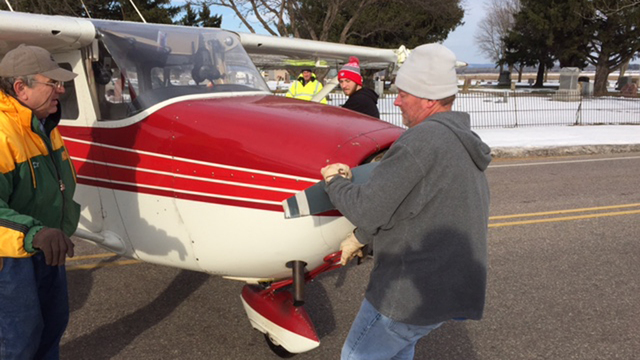 The flight originated from the Prairie Du Sac Airport (91C) about 1130. The pilot reported that he was flying locally at 4,500 feet after departing from 91C. The engine started to run rough and the pilot applied carburetor heat. He decided to return to the airport for a precautionary landing. About 4 miles from the airport, and lined up for landing on runway 18, the pilot increased the engine throttle, but had no response. 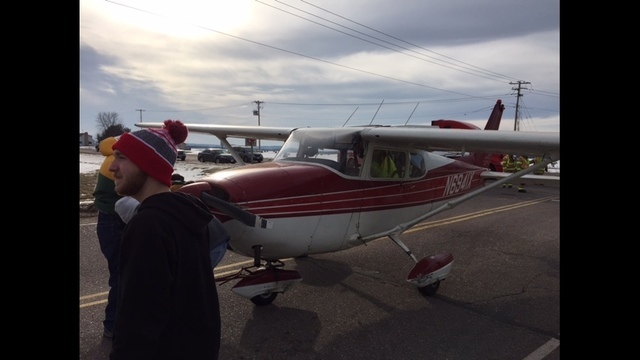 He decided to land the airplane on US Highway 12, about 1 mile from the airport. After landing on the roadway and coming to a stop, the pilot started the engine and attempted to taxi off the roadway. While taxiing, the airplane struck 3 road signs and an iron fence, resulting in structural damage to the left wing. 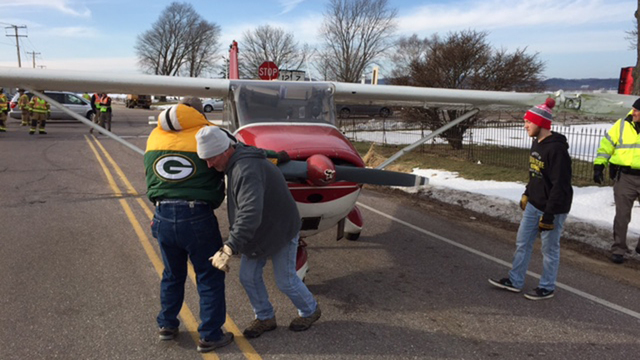 The local Sheriff closed the highway as the airplane was loaded onto a trailer and transported to 91C where it was examined by an FAA inspector. Approximately 4-5 gallons of fuel were present in each wing tank. Small amounts of water were present in the fuel from both wing sumps and the gascolator. The engine was started, ran normally, and both magnetos checked within normal limits. The fuel appeared to be automotive fuel. The pilot confirmed that he used automotive fuel. Initial review of the logbooks did not disclose that the airplane was approved for the use of automotive fuel. Nice old bird, hope she's flying again. This brings up a common gripe that a lot of us have. If auto-gas is $2.00/gal, why is av-fuel $5.25/gal? That is a factor of 2.6. Obviously av-fuel is not the same blend and if it was $4.00 per gallon I would not grip too much. In fact I can remember in 2005 when auto-gas was $1.65/gal and av-fuel was $3.15. That is a factor of 1.2. A fundamental cause of the mentioned accident is putting the wrong fuel (with alcohol?) in the tanks that absorbs water and promotes corrosion as time progresses. People cut corners largely because of economics. For safety sake, it is time 100LL came down to $3.80/gal nationwide.